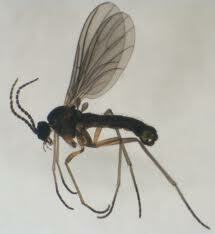 Some people call them gnats, others call them fruit flies. By any name, they’re intolerable! I detest the nasty little insects! When you try to eat, these unrelenting pests dive toward your food like kamikaze pilots and then into your face so quickly that you begin to feel as though they’re literally fighting you for your meal! With cantaloupe, apples and bananas in my kitchen at present, it’s no wonder I’m being annoyed by these pesky intruders. I love fruit but would rather not eat than do battle with these critters. So, in my determination to rid my space of the elusive pests, I did what I always do. Research. First and foremost, I found out something I never knew and didn’t want to know. They bite! The female actually needs a blood “fix” from a mammal in order to stay fertile. And once she mates, she will lay hundreds of eggs. Isn’t that encouraging? But hope reigns. I also found a suggestion about getting rid of them. And it works! My source said to mix apple cider vinegar with a tiny drop of vanilla flavoring, put it in a small container and place it wherever you’re seeing the gnats. Though a little skeptical, I did it without delay. Later this evening, I discovered one of my little blood-sucking intruders floating in the concoction. Just for a moment, I felt like dancing around my kitchen singing "Ding-dong the wicked witch is dead!" you're right peg. these things are very annoying. I hate them too. Funny post. Sometimes they're everywhere. You just can't get rid of them. I'll try the vinegar thing. thanks peg. How cute. I'm glad the vinegar worked for you. I never heard of putting vanilla in it. I've heard of dish washing liquid. I love fruit too and feel the same as you. don't want those things crawling all over it while I'm trying to eat it. GAG! Cute peg. As usual you say things better than anyone else. I love this post. I didn't know gnats bite either. Kamikaze pilots! What an imagination you have peg. I love the way you describe things. Keep them coming. This is cute and true. Your stories are so entertaining peggy.